Viola! Rhubarb and Haskap Jam! Ok, I know I missed a lot of steps there but this was all that was left when I got home after work so I wasn’t able to capture the other steps. I was able to capture the wonderful smell of rhubarb when I walked in. What a nice way to be greeted after work! We have still not ever made a rhubarb and strawberry pie, mainly because rhubarb comes before the strawberries and store bought strawberries are so expensive. Well, maybe that’s not the main reason. 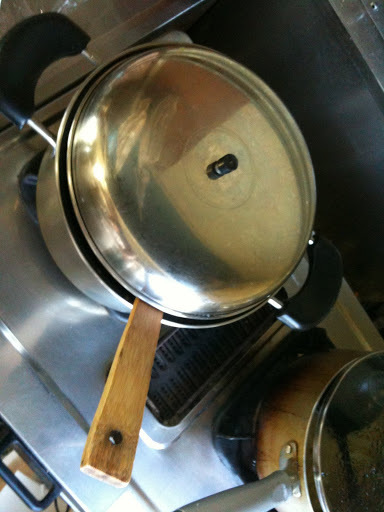 We are pretty frugal and pies, while very tasty, are relatively expensive and short lived. Jam on the other hand can be stretched out for a long time and eaten again and again on toast, pancakes and in yogurt and the like. One berry though that does go very well with rhubarb is the equally tart Haskap berry. Haskap is native to Hokkaido and is being called other things in North America according to an article I read on the Home Orchard Society website. Link later. Before when I had gone looking for an English name for haskap I couldn’t find one but then recently we were at a jam shop in Furano (?) and they were calling it honeyberry. I was skeptical and this jam here reminded me of my skepticism and I looked it up again. There were several hits this time, especially from Canadian websites. I agree with the Home Orchard Society when they say that the original name of Haskap should be used. Haskap is very tart and perhaps a bit bitter. 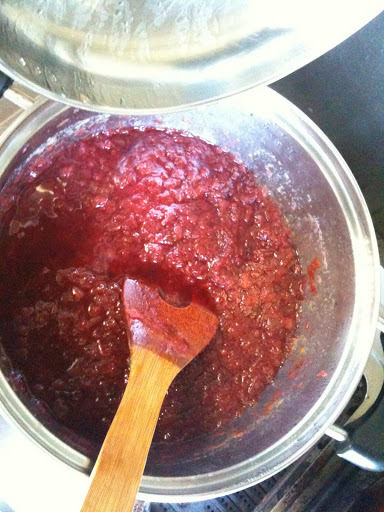 It also is very red or purple and adding just a little to your rhubarb jam, not only enhances the flavor but more than that, gives it a nice red coloring. 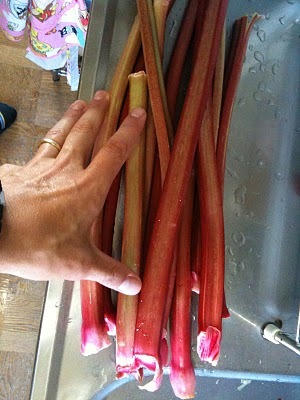 This is particularly nice if your rhubarb is not very red to begin with. For example we have two varieties. One that is mostly green and one that is red as you can see in the stalks in the photo above. If your haskap is very tart and a bit bitter, there are two things that could be the reason. First the most likely reason, they were picked green (inside). I have seen pictures on this blog of cases of haskaps that were definitely not ripe.